This is the second sock in the pair, which I finished this past weekend. They were intended as a Christmas gift for my husband's aunt. Obviously I did not get them done in time. There is only one sock here because I had given her the first completed sock at Christmas. 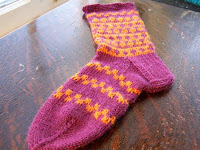 The pattern is from Nancy Bush's Folk Socks. 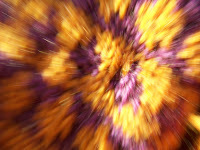 It was knit in Garnstudio's Karisma Superwash wool. The colors are fairly accurate. Oh - here is an "action shot", in which the colors are not quite right.